Find and compare the best prices from a range of well known car rental companies at Eindhoven Airport. This is a free to use facility, enabeling you to book direct with the company quoting the price. It is being reported that strong winds are causing some flight delays at London Heathrow and London Gatwick airports. An extended and refurbished terminal building was opened at Eindhoven airport in 2013. A bus service connects the airport to Eindhoven and the railway station. There is an express bus service from Eindhoven airport to Amsterdam. Taxis are available, the journey into Eindhoven taking 15 to 20 minutes. Eindhoven airport has 5 bars/restaurants, 6 shops, a business centre with a selection of meeting rooms available, and FREE WiFi Internet access. The 120 roomed Tulip Inn Eindhoven Airport hotel was opened in 2013 as part of the airport expansion and is attached to the terminal. The Novotel Eindhoven Airport, which also has conference facilities, is located approximately 1Km from the terminal building. 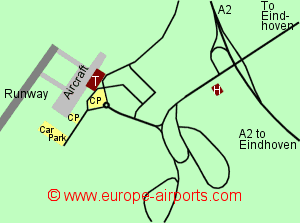 Eindhoven airport has Airport Carbon Accreditation, at the Neutrality level. 5.6 million passengers passed through Eindhoven airport in 2017, a 19% increase on the previous year, making it the second busiest airport in the Netherlands.